Wondershare Flash to iPhone converter is a professional conversion tool that can convert Flash to iPhone (SWF to iPhone) with excellent quality. Besides converting Flash to iPhone MP4, it can also convert Flash audio to MP3, M4A, and AAC files for playback on your iPhone and various audio players. Wondershare Flash to iPhone has very useful features such as browsing your cache files, adding watermark, batch conversion, video crop and so on. DirectX 8.1 or above; 500MB Hard Drive(s); Macromedia Flash Player is required, iTunes 7.3. Try Wondershare Flash to iPhone now and enjoy your Flash files on your iPhone! Convert Flash to iPhone video with high output quality! Extract and convert Flash audio to MP3, M4A and ACC to playback on iPhone and various audio players. Convert Flash to MP4, M4V, MP3, M4A, Mp3, AAC etc. Convert multiple files at a time. Save the Flash files from the web pages you have viewed lately and let you choose and convert your favorite files. 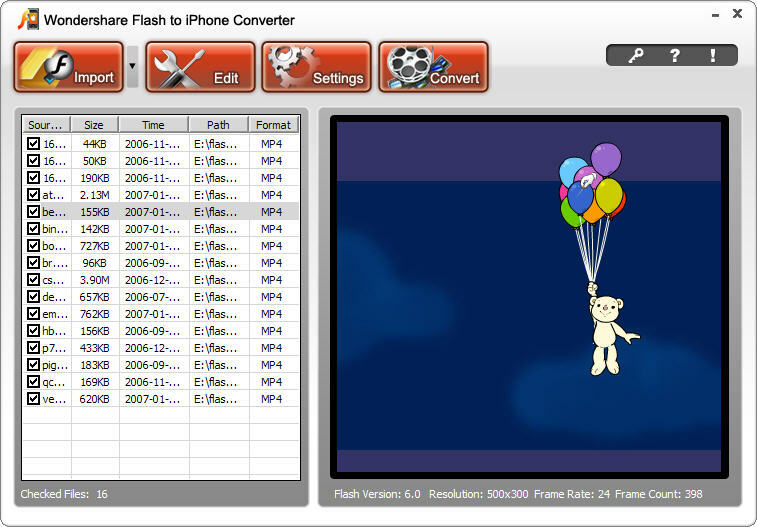 Show the version, total frames, time length and some other information of each imported Flash file. Let you add a customized watermark on the output file to prevent others from using it without your permission. Crop your Flash video to remove the unnecessary parts. Qweas is providing links to Wondershare Flash to iPhone Converter 1.2.54 as a courtesy, and makes no representations regarding Wondershare Flash to iPhone Converter or any other applications or any information related thereto. Any questions, complaints or claims regarding this application Wondershare Flash to iPhone Converter 1.2.54 must be directed to the appropriate software vendor. You may click the publisher link of Wondershare Flash to iPhone Converter on the top of this page to get more details about the vendor.